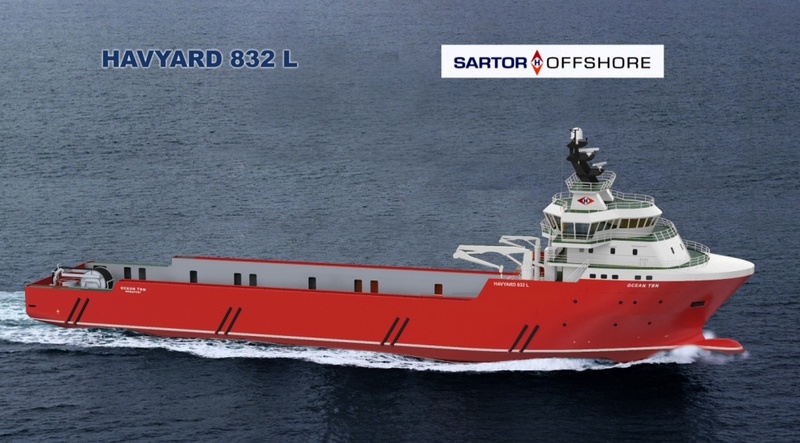 Sartor Offshore has ordered a Norwegian ship design developed from Havyard Ship Technology AS to approx. 300 million. The PSV, which will be built at shipyard in Sogn, is scheduled for delivery in January 2012. “The contract is based on optimism within the industry. Currently, the vessel does not have a contract, however, the energy in the marked is intensifying and we regard the decision to build as forward looking and the right decision” CEO Roy Wareberg in Sartor Offshore says. The vessel has been developed in Norway, where there already have been built eleven ships of the type Havyard 832 L. Sartor Offshore has also secured an option for an additional vessel with delivery in June 2012. The Havyard 832 L –design has set a new standard for medium-sized supply vessels, as it offers greater cargo capacity and more flexibility, better performance and lower fuel consumption than competitive models. Completed vessels are all awarded long-term contracts, and have received positive feedback from owners and crews. Sartor Offshore currently has 24 vessels in the portfolio and has begun an extensive renewal program. The company is positioning itself to take an international and leading role as supplier of MRV and PSV, which implies readiness, supply and oil spill response. Sartor Offshore has about 600 employees and has its own operating company in Aberdeen. “The contract from Sartor Offshore is yet another acknowledgment of the design and functionality of Havyard 832 L. We have succeeded in developing modern, environmentally friendly and competitive vessels that are sought after both shipowners and charterers” Geir Johan Bakke of Havyard says. Sartor Offshore already notice that there is greater optimism and activity both onshore and offshore than last year. The initiated renewal program makes the Sartor fleet more attractive customers. The company already has long-term contracts today with clients such as Statoil, Total, GDF Suez and Shell. The new vessels also hold the highest safety class. “We want to increase our presence through PSVs” Wareberg explains. He is pleased that the Norwegian shipyards again are competitive in quality and price. Financing is arranged by Pareto.